This coin, a 1944 San Francisco Mint One Centavo recently surfaced from an old collector's hoard. It seems to be the first reported error of a United States and the Philippines coinage that is unique. Previously reported off-metal coins were either under the categories of double denomination or a coin struck on a planchet used for another denomination or a coin struck on foreign planchet. But since this coin is very unusual, it may either be a pattern or a trial strike. Basically it is not made of copper nor silver but a white metal. The metal seem to belong from the Platinum family due to the metal's characteristics; heavy, white, and hard. 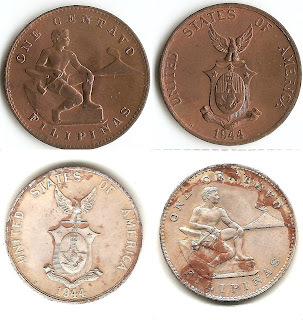 I have researched other contemporaries of the 1 centavo United States & Philippines coins minted by the San Francisco Mint but nothing comes close to the exact dimension, weight, and composition minted for for other foreign country and even for the United States itself. Through a friend, I was told that there was also a brass specimen discovered 3 years ago. I went to find out if the information was true and I was not disappointed by the result after I saw the coin. The coin was not in great condition though unlike this one, though it is evident that it was really struck in brass and the die is exactly the same used as the above. I have found out through comparison that there were literally several dies used for the 1944 One Centavo. One specific variety has uniform set of stars located on top of the shield while another one has a seemingly flat and fat star on the left. Others have medium-size mint marks while on the other hand I have also discovered a specimen with a very small mint mark. This suggest my suspicion that the Mint could have used several dies for the 1944 One Centavo and they have made several die trials to test these dies. Yet of all the trials made during that period, this one seem to be unusual since U.S. Mints have only tried using platinum for die trial during the 1800 because the metal has not yet been popularized by the industrial age. Aside from the fact that it was intended only for then United States colony, the Philippines.